The Reverend David Timothy Robinson, 91, went to be with his Heavenly Father on September 3, 2018. He passed away peacefully at Piedmont Medical Center, Rock Hill, SC, with his three daughters by his side. 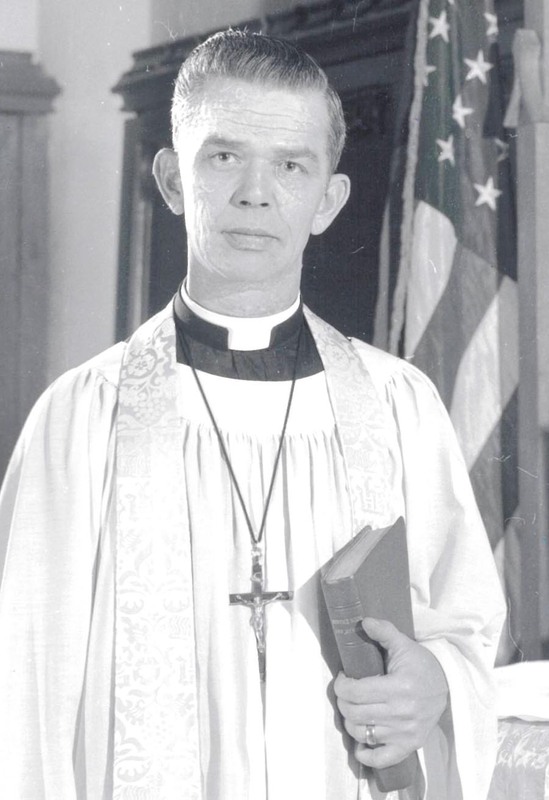 Born July 19, 1927, in Hagerstown, Md., Pastor Robinson was the son of the late Reverend Dr. Ralph Carlton Robinson and the late Margaret Rohrer Robinson. In addition to his parents, Pastor Robinson was preceded in death by his devoted and loving wife of 61 years, Gwendolyn Witt Robinson, and his sister, Hannah Robinson Arnold. A World War II Navy Veteran, Seaman First Class David Timothy Robinson, served in the South Pacific from 1945-1947. He took part in the Operation Crossroads Bikini Atom Bomb Test in 1946 aboard the USS Pennsylvania BB-38. He also served on the USS Astoria CL-90. He was a graduate of Newberry College (SC) in 1953 with a BS degree in English, Language and Literature. In 1960, he received his Master of Divinity in Christian Education and English Bible from the Gettysburg Lutheran Theological Seminary (PA). Pastor Robinson dedicated his life to the Lord as a dynamic Lutheran Minister serving five churches in the Central Pennsylvania Synod and three churches in the South Carolina Synod. After retiring, he served as a supply minister to churches in SC and NC. As a member of Grace Lutheran Church in Hendersonville, NC, he was one of seven retired ministers (with a total of 338 years of pastoral experience), known as the Magnificent Seven, who became the ministry team for 19 months while their congregation went through the call process for a new minister. During his ministry, Pastor Robinson served on many Synodical committees including stewardship, the Lutheran Social Services Executive Board, Youth Probation Boards, President of Mifflin County Ministerium Board, President of Lewistown District Pastoral Association Commission on Camping Executive Board, President of the Lutheran Camping Corporation, Convention Chaplain, Civic Club Speaker, College Campus Preacher and Lecturer, to name a few. In the Minister’s Annuals of 1987-1990, compiled by Jim & Doris Morentz, six of Pastor Robinson’s sermons were selected and published by Abingdon Press. He was a loving husband, father, grandfather and great-grandfather. Pastor Robinson was a kid at heart, always bringing a smile and laughter wherever he went. He knew no strangers. One of his passions was working with the youth of the church. He was affectionately known as “P.R.” impacting the lives of so many in the churches he served. Pastor Robinson dearly loved his pet animals, nature and the outdoors. He grew up hunting and fishing in his beloved Pennsylvania mountains and valleys. Robin Wood, a family cabin near State College, PA, became a second home for his family and his hunting friends. He loved Robin Wood and cherished the many happy memories made there. He also enjoyed golfing and snowmobiling. Surviving are his three daughters, Mary Robinson Walker (Bill) of Columbia, SC, Lynn Robinson Liebenrood (George) of Latta, SC and Martha Robinson Stephenson (Art) of Hickory Grove, SC. ; grandchildren, David Benson Walker, M.D. (Jennifer) of Raleigh, NC, Jonathan Andrew Liebenrood (Stephanie) of Simpsonville, SC, Megan Brown Hoyt (Mickael) of Fort Mill, SC, Lindsay Walker Starkey (Robert) of Lexington, SC and Nicholas Edward Liebenrood (Sarah) of Simpsonville, SC; and great-grandchildren Lauren and Alex Hoyt, Emily and Walker Coppney, Claire Starkey, Harrison, Jacob, Jaclyn and Coleman Liebenrood, Alex, Jocelyn and Avery Walker. Nieces and nephews in Pennsylvania and Florida. The family would like to extend their sincere appreciation to the staff of Brookdale at Spring Arbor for their loving care over the past several years and to the staff of Piedmont Medical Center during Rev. Robinson’s brief stay there. A memorial service celebrating the life of the Reverend David Timothy Robinson will be held at 3:00 p.m., Saturday, September 8, 2018, at Grace Lutheran Church, 426 Oakland Avenue, Rock Hill, with the Reverend Scottie Burkhalter officiating. The family will receive friends immediately following the service in the Church Fellowship Hall. Memorials can be made to Grace Lutheran Church, Endowment Fund, 426 Oakland Avenue, Rock Hill, SC 29730.